I look at the documents open on my computer. I need to write a story. About what I can do. How and where I fit. How much I want this. I picture myself, a broken me, as a piece in the giant machinery of an organization. Maybe my cracks will not show from a distance. Once I’m part of the bigger puzzle, maybe I will fit in and play my role in completing the picture. But for now, I need to tell my story the way it is. No, nothing positive really came from the loss. But it sucked the wind from under my wings. I am trying to get a little bit of it back. I hope I do it with you. Despite my consistency of ritual, my album of photos, my constant urge to collect poems and words that help me hold her close—somehow the inertia of life has swept me away and with it my desperate attempts at reasoning. How is it that a tiresome wave of deadlines, emails, forms and files could distract me from my daughter? There’s another unnamed word document opened on my computer, along with this one. It contains the idea for a paper my advisor had sent me in winter. It should have been written in the past few months. It has not. Even the file containing the idea has not been saved. That’s how my career is. Unsaved, undeveloped, unwritten. How can there be anything else, I wonder every day. How can there be anything else, apart from missing Raahi and taking care of Aahir and Som, that my mind can occupy itself with? How can I miss, feel sad and have regrets for, anything else? How can anything else matter, and cause me pain? There was a flame. The only one that burned. The flame that kept me alive, gave me purpose, offered me flight. The flame to be exceptionally trained, hardworking, and skilled, and make a difference somewhere, soon, and then forever. As a teenager, I was never interested in romance or a family. I was fierce, and almost destined to be a hardhitting corporate dragon or academic eagle someday. My friends already teased me with the jobs I would have to get them and the research projects I would have to acknowledge their encouragement on. My male friends sympathized with any man who ever eyed me ‘that way,’ and my female friends wondered what this hankering for my ‘own identity’ at fourteen was all about. Then I met a man for whom sacrifices seemed possible. We made joint decisions about our careers, which somehow always seemed poised in head-on collision with one another, and I saw my career in media and publishing gradually taking the backburner in order to accommodate his more successful one in technology. Still, I had a career, and much to look forward to, and every time a byline appeared, or someone praised my ‘keen editorial eye,’ I warmed a finger in that flame, now dimmed, but not extinguished. Then we started wanting to make babies. A surgery to remove a cyst, followed by an unexpected pregnancy, followed by a heartbreaking miscarriage. Then, a year and half later, another one. This time, the doctor advising me to give up my job.When my husband’s employer decided to transfer him to the US, I finally wanted to go back to graduate school, even though all I really wanted at this point was a family. The flame was going strong, except that it had changed color. I often could not recognize myself. But I was getting to like this new me, the one who wanted to be a mom. Suffering from undiagnosed infertility, I focused all my energy into applying to a second Master’s, and instead, was offered positions in four prestigious PhD programs. Every admissions committee wondered why I wouldn’t accept these better offers. The truth is, I wanted it too, but I wanted to be a mom a lot more. I was not ready to commit to five years, and accepted a Master’s admission, moving to the Midwest, leaving my husband, and all chances of being a mother soon, in the northeast. Aahir came to us in the end of the first year. By now, my first and foremost mission of a family accomplished, I wanted that PhD after all. My husband wanted a graduate degree too, a plan he had shelved as someone needed to have a stable job amidst all the instability and uncertainty of not being able to get pregnant. We started applying to graduate schools together, and chose ten pairs of schools in the same city. We got admission in two each, none in the same city. So, with my son in my arms, I moved to Chicago, while my husband quit his job, but stayed in Columbus, to go to school there. He would commute on a bus for ten hours on Thursday nights to spend three days being a father. On Sunday nights, he made the same trip back, this time, to be a student. That summer, after the first year, we were together as a family after a whole year. We were still staring at another year of being apart, but we were so happy that we made a little girl! Now pregnant, and taking care of a toddler, my professional flame burned the brightest for the first time since those young days of dogged determination. After putting Aahir to sleep, I would drag my pregnant body to the dining table, where I would eat dinner and write papers, grade exams and read a hundred pages before I dropped on the pile. Som now arrived on Thursday mornings, and after whirling like a windmill taking care of Aahir and me, he would work until dawn on papers, projects and coursework. Then he would take the train to downtown Chicago on Sunday night, and from there a bus at midnight to reach Columbus in the morning, heading straight to class. Raahi was born three days before Som would be done with his program. As he packed his life in Columbus, the birthplace of our Aahir, and the battleground for my warrior husband, Raahi began to fight her battle in NICU. She came home in time for us to move for Som’s hard-earned job on the east coast. I had to give up my workplace again, in order to be with my husband, and raise our kids. Our family was complete, my reproductive aspirations had been hard-earned, and it was time to focus on my productive ambitions. Raahi left the day after Som started his job. Along with Raahi, I also lost the structure in my professional life. Left without a campus, an office, meetings, events, and colleagues to occupy my life, it has been impossible to feel productive or purposeful. In the absence of a swinging infant in the house, the desk, chair and bookcase suddenly seem too wooden, too pointless. The eleven unpacked boxes of useful and useless papers and books in the office are a few feet away from unpacked boxes of diapers and baby clothes in the closet. There is a computer whose battery has slowed from the months it was not turned on. Because it houses still and moving images of my daughter’s tiny life. I could not see them, and I also could not open the dozens of papers and projects also contained there. The burning flame, a desire. As a girl, it was to make a mark, a difference. Then another one started to flicker. As a woman, I wanted for the flame of my motherhood to warm my home, and the fire of my intellect to signal my place in the greater world. For the most productive years of my life, I have struggled to be reproductive. Now I am neither. After ten years of trying to have a family, and of giving up everything else for it, the two flames burned together for a little while, and then died down together, forever. How can there be anything else, I wonder every day. And yet when I read about someone not having time because of a job, or struggling with their job, even if it is a bereaved mother, I wish I had something to show for my fourteen years out of college. For my thirty-seven years of life. Other than a desk and a bookcase and eleven unpacked boxes of useful, and useless, papers and books. What other kinds of loss have you been dealing with along with grieving your baby(ies)? How has your loss affected your views of your career and your intellect? Have you returned to work since your loss? Do you take refuge in working, or does it add more stress to your life? October 13, 2011 / catherine w.
I am a professional nitpicker. 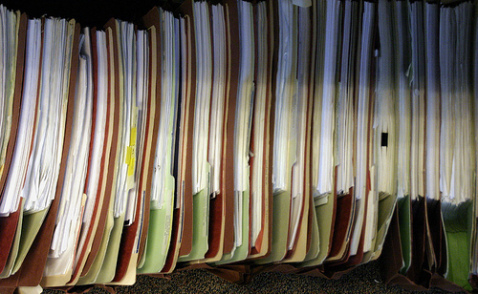 I sift through documents, link them up to one another, count them, summarise them. Before my daughter died, I’d spent nearly five years analysing other people’s sad stories, their deaths, hospital admissions and operations, reducing them to numbers to be crunched. I treat them with more respect these days. Try to approach my computer with a bowed head and leave a little pause as a mark of respect before I attempt to weave these records into a palatable form. Because these documents, when viewed in their human context, tell some tragic stories. One of them is mine. The strangest day of my life was comprehensively documented. Hospital records show my time of arrival in the accident and emergency department of the local hospital with back pain, the back pain that turned out to be premature labour. What should have been December instead one clear summer night in August. The birth transcript from the next morning records the dates and times of my daughters' births. It looks like any other record, the hospital must spew out tens of these documents every day of the year. But the recorded birth weights cause something to catch in my throat. There are a plethora of other documents, transfers to the NICU, treatments administered, the reactions of our daughters, our reactions. All meticulously noted down. Box files upon box files full of paperwork. When I open my daughter's memory box, there seem to be two distinct categories amongst the contents. Little woollen hats, photographs of my hands stretched over her bruised little frame, photographs of her dead body cradled in the arms of my husband, her ashes. And formal documentation. Birth and death certificates, medical records, the paperwork that I must pass on should I ever have her ashes interred. Somewhere between these two imperfect, inadequate records sits my daughter's memory. All that is left of her is contained within that box. I have retained the slip of paper that informs the registrar that a death has occurred. Signed by the doctor who witnessed her death and decided what caused it. I quite like to think of that quiet, gentle man bringing the whole power of his considerable intellect to bear upon that question. That just for a few minutes, perhaps, she filled his mind as he disentangled the chain of events culminating in her death. A tiny, icy comfort. My husband and I had to take this small slip to the registry office. I remember driving there resentfully, sulkily, wishing that someone else could do this. Hardly believing that we were expected to. My introduction to the unrelenting world of parenthood a strange one but still one with an inescapable truth at its core, nobody else is going to do this for you, be your child living or dead. The buck stops here. I sat in a chair over the desk from the registrar. I seemed to be able to view myself from the outside. I could see the registrar looking at a person who looked like me, who appeared to be holding things together but, in reality, I had been decanted somewhere to the right of myself, gibbering, trembling and translucent. I am certain that I was not the woman who sat in the chair and calmly handed over the slip of paper, the proof that her daughter had died. I remember that I wanted to sign for my dead daughter's birth certificate. But I couldn't bring myself to sign for her death certificate. My husband did that. He is listed as the informant on her death certificate. His qualifications for doing so listed as being her father and as being present at her death. Such dry little phrases concealing such a world of awfulness. The registrar spelt one of the causes of her death incorrectly. I wanted to ask her to change it but I couldn't get the words out, they clotted in my mouth. Now the mis-spelling glares at me accusingly. I left clutching those documents tightly in my hand, the only proof that I had not imagined her existence. Clinging to the sad, strange consolation that, should some great-great-grandchild go looking whilst researching their family tree, they would come across her. Seven months after my daughter had passed away, a receptionist in some far flung part of the hospital ‘phoned me. To ask if I would be bringing the twins in for their hearing tests. For a moment, the room swirled around me and I saw my thin, ghost girl alive somewhere. In a hospital filing system. Preserved there. Squashed between files like a pressed flower. And part of me didn't want to tell the woman on the other end of the phone that she was dead. Because I would have liked to maintain the pretence and she was my only co-conspirator. When my son was born, nearly three years later, my husband and I went to register his birth. "Only one?" asked the registrar, "Are you sure you aren't hiding a twin anywhere?" She probably says this to every family that comes through her door. "No," I replied. "Just one." But there is a hidden child in our family. She's been hiding for a long time now. Did you have to complete any paperwork relating to the death of your child? Did it bring you any comfort or cause you further pain? Or did an absence of paperwork cause you hurt? Did you find any kind souls amidst all the bureaucracy? Or any callous ones? Have you had the disconcerting experience of someone in the 'system' contacting you assuming that your child was still alive?